One Short Day by Kristin Chenoweth with length 3:03 includes a beautiful voices choir, great for the mood, fun and positive. Theme of the song is the musical. It includes a huge voices choir and a story of life is beautiful when you walk in Emerald City together with your friends. In execution, it is reminiscent of cartoons about Tom and Jerry, especially in the scenes when someone is being chased by someone. (spoken) Come with me. To the Emerald City. (spoken) Oh, I've always wanted to see the Emerald City! There are buildings tall as Quoxwood trees! And I think we've found the place where we belong! 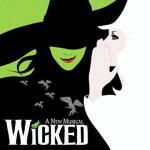 (spoken) Elphie - come on - we'll be late for Wizomania! Is making all Oz merrier? (spoken) The Wizard will see you now!